Stephen Cole looks at hockey’s wildest, most unpredictable era: the 1970s. 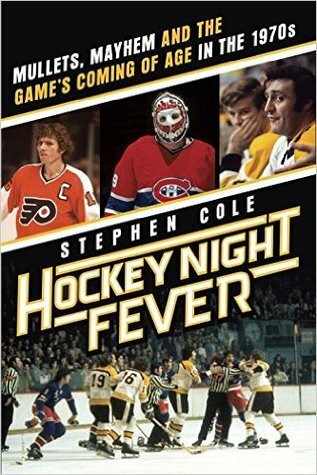 By following the decade’s most dominant teams – the Boston Bruins, the Philadelphia Flyers and the Montreal Canadiens – Cole examines the game’s transition from the classy sportsmanlike conduct of the 50s and 60s to the rough and tumble brutality of the 70s. By the time the disco decade danced onto the scene, the NHL had been experiencing a lull in popularity. Luckily for them, the game was evolving. Gone were the days of sportsmanship and honour; enter mullets, missing teeth and bruised knuckles. When Bobby Orr and Phil Esposito’s Boston Bruins changed how the game was played with their mixture of skill and intimidation, you either had to get with the times or get out of the way. It wasn’t long before Orr’s army inspired the famed Broad Street Bullies, Bobby Clark’s ferocious Flyers, a team that destroyed and punished their opponents in the rink. While they were busy bruising bodies, the Montreal Canadiens were constructing an unbelievable juggernaut. By the time 1976 rolled around, the Habs produced a team so full of talent, that even today they’re still arguably considered the greatest hockey team ever assembled. While the bulk of the book’s focus is on those three hockey clubs, Cole also sheds some light on the 1972 Summit Series, the rise of the WHA (World Hockey Association) and the NHL expansion. They’re welcome distractions from the sometimes monotonous play-by-play but it also left me wanting more information – especially on the WHA. There are probably other books written on the subject, so it’s a minor complaint. After all, Cole can’t include everything. Hockey Night Fever is an uncompromising look at the vicious yet brilliant talent assembled in hockey’s most tumultuous decade.